Former world 200m champion Ato Boldon says he has sympathy with athletes who fail drug tests because of supplements. But former 100m Olympic and world champion Donovan Bailey insists there can be no excuses for athletes who take banned substances. 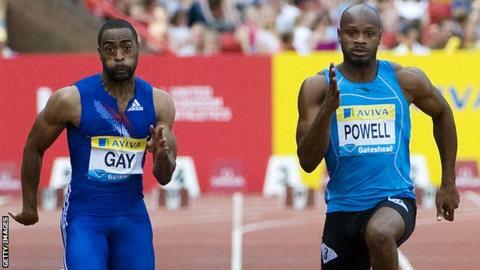 After sprinters Tyson Gay and Asafa Powell tested positive for banned drugs, Boldon said: "An athlete does not have a degree in pharmacology." But Bailey said: "Athletes must know what is on the 'banned' list." The Canadian added it could be time to consider life bans for those caught taking banned substances. Bailey, who will be a BBC Radio 5 live summariser for the Anniversary Games and World Championships, said: "Ultimately it could be the new false start rule - it doesn't matter who you are, if you false start out of the blocks, you're out." It is not known which substance Gay, the fastest man in the world this year after running 9.75 seconds, has tested positive for. That information should be made public once the result of the American's B sample is known. Powell, who has clocked 9.88 this year, was tested at the Jamaican trials in June and returned an adverse finding for oxilofrine (methylsynephrine), a stimulant that boosts fat-burning. Boldon said it was important to make a distinction between blood-doping and "people trying to push the envelope with their supplements". The former Trinidad and Tobago athlete added: "An athlete is trusting of the person he is buying the supplements from, or the coach, or whoever is providing these supplements. "When you listen to Tyson, he is saying he put his faith in someone and they let him down." Bailey, who won Olympic and world 100m gold medals and has held the 100m world record, has a zero-tolerance policy on drug-taking. The 45-year-old said: "Every single athlete is given a banned list and they should look carefully down it. "When money is involved, you are going to have cheats, people who push the envelope. We are in a sport where one thousandth of a second can be the difference between success and failure. "Athletes who take drugs tend to be insecure. They don't believe they have the physical and/or mental capacity to do great things so they take another route - the pharmaceutical route, if you like." On Gay claiming he was let down by someone he trusted, Bailey added: "You don't go to an athletics meeting to watch the trainer, coach or masseur run a race. The onus is 100% on the athlete to take responsibility for any substances going into their body." Boldon suggested stimulants and supplements are here to stay and said it was naive to think they could be banned. He added: "I think the problem is in trying to push the envelope and get to the edge, several of the top names in the sport are falling over the edge." Lord Sebastian Coe reacted to the positive tests by insisting that athletics will intensify the fight against drug-taking. Lord Coe, vice-president of the International Association of Athletics Federation (IAAF) and chairman of the British Olympic Association, said: "The most important thing for me is that the testing system is working. "For the sake of clean athletes, it is very important we do not flinch in our efforts. "This is not a war we can afford to lose and it is important for any athlete to know that if they want to risk cheating that they are going to get caught."